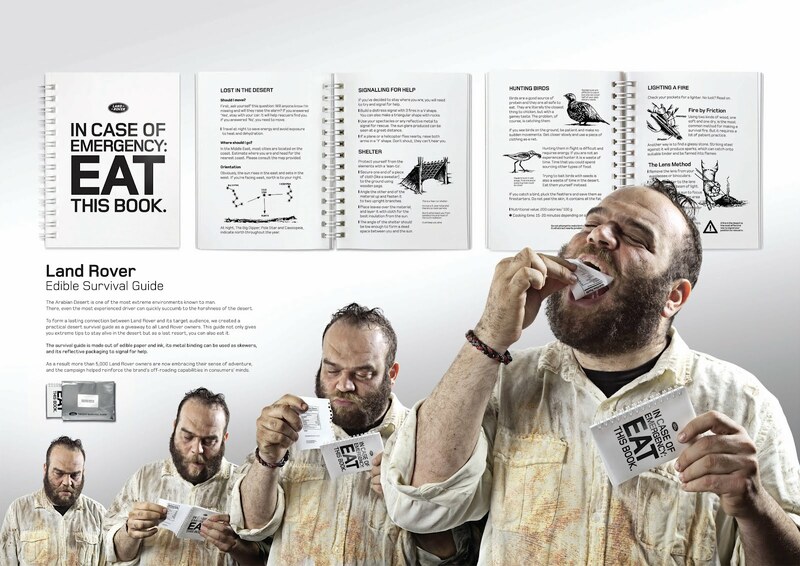 Land Rover Edible Survival Guide, It's not a usual safety guide book. You can also eat this book in an emergency situation!. It's such a great ideas since land rover was known as the vehicle for a heavy field situation such as in desert or forest. so in case you're lost in the desert or forest and you ran out of food supplies then you can eat the land rover survival guides. This survival guides consists of tips about how to survive starting from how to signalling for help, looking for a nearest coast, and the tips to make a fire from lens. It's such a useful guides to stay alive in the desert and for the last resort you could also eat them since the book is made ​​of edible paper. Even though the taste isn't as good as Hamburgers but it seems that should help you in the extreme condition in desert.